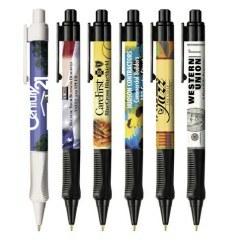 Bulk stock design pens with finger grip, personalized with your message printed over our full color stock image. Budget Prices for USA, Canada for stock image pens with custom overprint. Superb craftsmanship and writing quality. Our design (full color image), your imprint: choose among hundreds of stock full color images for virtually any type of business or type of event, and imprint your text or logo over it. Please see our stock images. You may select any as a background for your text or logo. You just have to indicate the selected 3-letter code under our stock image, and Email us your custom 1-color imprint to be placed over the image. Please also check our wholesale custom photo pens : pens with your own full color photo or image. Basic unit price includes your 1-color custom imprint imprinted over our stock image of your choice. Please contact us if you require more details. Pen Size: 6" x 1/2" diameter. Medium ballpoint pen with very smooth writing.